The Peking Opera can be traced back to ancient times when dancers would perform at religious ceremonies and the festivals of feudal lords. The dancers, accompanied by lutes and pipes, would act out battle scenes as monsters and animals from folklore. As international trade, the Chinese culture grew with the influences of its international neighbors. This constant evolution of the arts eventually led to what is now the modern Peking Opera. One of the most important events in the development of Chinese classical theater was, ironically enough, the Mongol conquest in China (1280 –1368). Due to Mongol Yüan occupation many learned Chinese men were forced into retirement, and turned to art as a form of expression creating an explosion of inspiration and artistic exploration. There were two types of plays during this time, the fast paced tragedies in the North (tsa-chü) featuring the p’i-p’a (see instruments and music), and the slow romantic Southern plays (ch’uan-chi), which had lighter endings, accompanied by the lute. Later, during the Ming Dynasty (1368-644) “popular” theater sprung up. 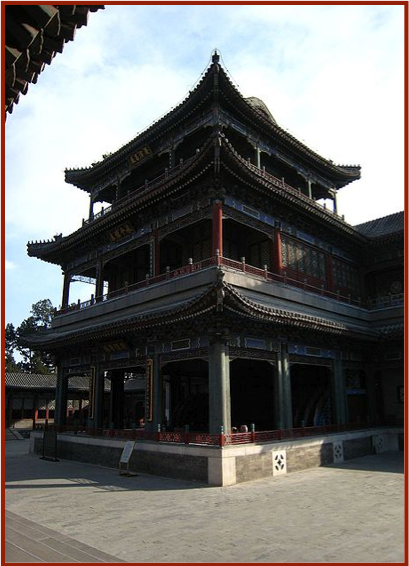 These theaters were the Tunes of Yiyang (Yiyang ch’iang), and the clapper opera (pang-tzu ch’iang). 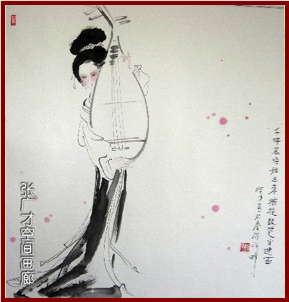 The tunes of Yiyang began in the South, and were based on local folk songs. It also featured a chorus instead of the traditional orchestra. Upon becoming popular, the Tunes of Yiyang spread across China, each region adapting it to suit its dialect and folk tales. Alternately, the clapper opera began in eastern Shensi. It was named the clapper orchestra because of the datewood clappers used to create its rhythm. 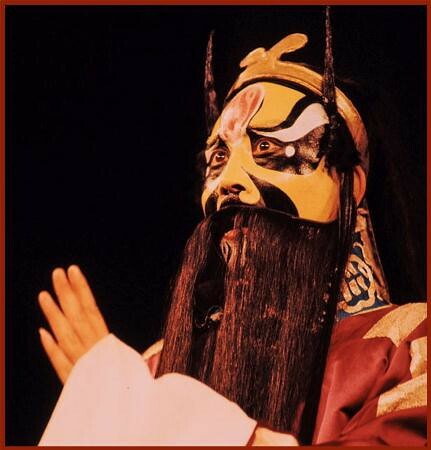 The Ming Dynasty was also marked the creation of K’un- ch’ü, the predecessor of the modern day Peking Opera. Due to its location at the bottom of the Yangtze River, theater thrived in southern China. The merchants in Yangchow would patronize the opera (many of them owning private theater companies), while Soochow quickly grew into cultural hub. It is here that K’un- ch’ü was created. Founded by the composer Wei Liang Fu and the poet K’un Shan, K’un- ch’ü was a revitalization of the old operas and music from the southern dramas (ch’uan-chi). Based in Confucianism, K’un- ch’ü follows a romantic theme, and was loved by the learned (officials, scholars, and gentry) who did not like the commonness of the folk operas. Because of this following, K’un- ch’ü was extremely popular for 300 years, until the T’si Ping rebellion (1853) led to the economic fall of Soochow and Yangchow, causing many artists to move to Shanghai in order to support themselves. At the same time the country experienced a shift towards more Confucian morals, marking the beginnings of the Communist Era. Around the 1850 K’un- ch’ü split into many schools, one eventually becoming the beginnings of the Peking Opera. But K’un- ch’ü is still very important to the Peking Opera today. K’un- ch’ü music is one of the fundamentals of the opera, and one that every actor should know. In fact, many plays include a section where either the singing or music is in the K’un- ch’ü style. With its slow tempo this type of music is best used in situations where the actor is pantomiming or dancing with exaggerated movements. In the 1850’s people started to see K’un- ch’ü as dated and inaccessible to the populous, and so it was modernized and became the Peking Opera. 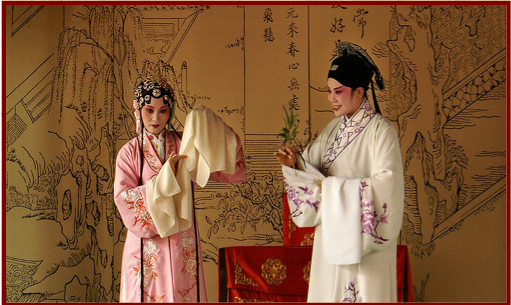 Known by the names Peking Opera, Beijing Opera, Ching hsi, or Jinju (“theater of the capital”), the opera is not just limited to the Beijing (also known as Peking) area, but is also present in most provinces in China (Riley 13).,. 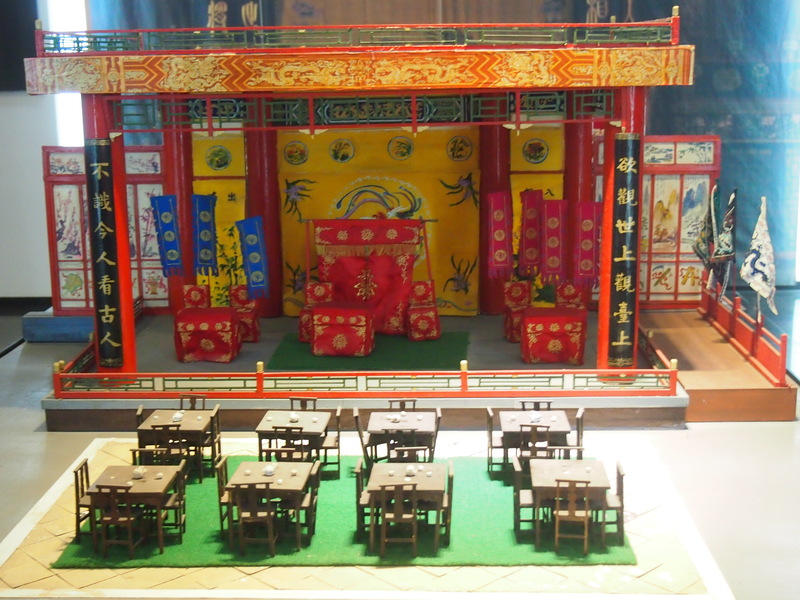 There were originally two types of playhouses for the opera in Peking called the hsi-chuan and the hsi-yüan. 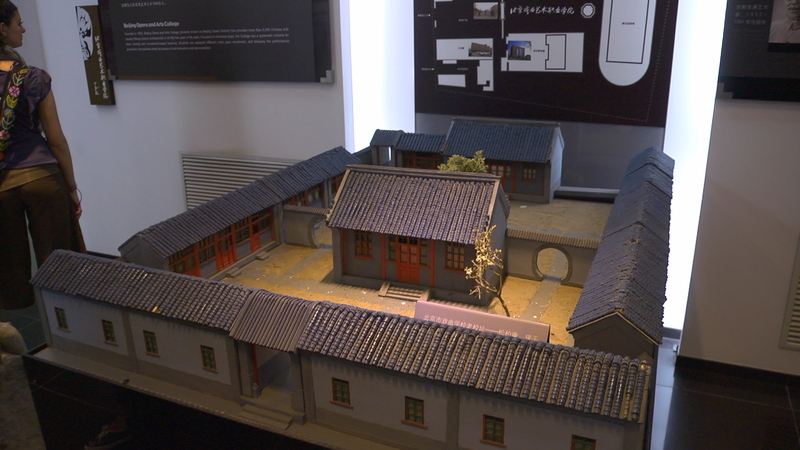 The hsi-chuan was a more exclusive theater used by gentry and officials for private parties (tang-hui), while the hsi-yüan was for the ordinary citizens. The atmosphere of the hsi-yüan is very different from a traditional Western theater. The audience would yell and jeer loudly at the play while vendors milled around, selling their wares (peanuts, fruits, earrings and such). Playgoers bought entrance at the door, and then were separated in sections based on socio-economic status. While those with money sat in cushioned seats in the balcony, the poor were placed on the bottom floor. There was no playbill so the audience would not know what play they were seeing. Peasants would even try to find out what play was being performed in order to sell the information to the patrons (Makarras 84-87). The rise of China’s Communist regime turned the theater world on its head. Citizens had been dissatisfied with the traditional plays of the past. They felt that the stories of emperors, nobility and concubines were not relevant to their everyday lives. Chou Yang’s Great Leap Forward movement (1958-1963) affirmed this belief, by stressing that “there should also be a leap forward in drama expressing modern life”(Mackerras 168). This tradition continued throughout the Cultural Revolution (1965) when many of the traditional plays were banned in exchange for modern revolutionary plays; although 1952 many old scripts were brought back for the first annual Festival of Classical and Folk Drama. Although they banned a lot of traditional works, the Communist regime also brought in positive changes to the opera. By 1966 all theaters were nationalized, guaranteeing pay for actors who were living in substandard conditions. The government also created the Chinese Drama School in 1949 in an effort to stop the maltreatment of acting students in the opera, and effectively ending the laoshi /student relationship (see Training of a Peking Actor). Most theaters have been renovated and resemble Western movie theaters. There are no longer segregated sections based on class and the audience is calmer. In recent times the opera has taken steps to make sure that women are actually playing the female roles, and the revolutionary play Asalea Mountain even has a female heroine. During the Ch’ing Dynasty (1644-1912) women were not allowed in the hsi- yüan’s because it was thought that interactions between sexes would lead to immoral behavior. The only plays women were allowed to see were plays held at temples to honor the gods (with exclusively female audiences), and plays for special occasions such as weddings and birthdays. This ban was upheld until 1924. Women were not only banned from attending the opera, but they were also not allowed to participate in them. Men played both male and female roles, a practice similar to those in Shakespearean plays and Japanese Kabuki. There were a few all-female acting troupes that preformed at private parties, but the majority female actors were concubines or prostitutes called the sing-song girls. In fact, the sing-song girls were an integral part of the spread of the K’un- ch’ü, as they would performed K’un- ch’ü plays for their male patrons. Women were not accepted into the theater until the Communist party gained power, and in the 1930’s the unisex School of Drama was created.